Here's the shirt I wore to Friday's show! 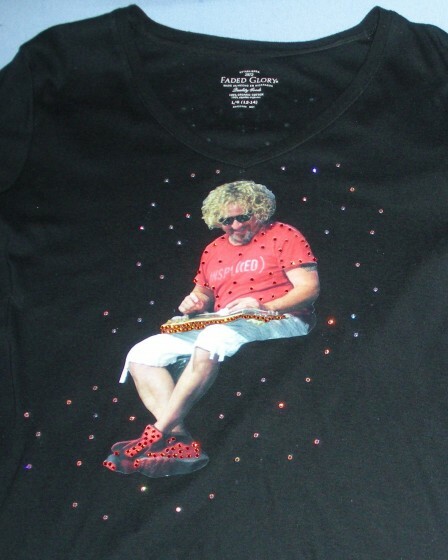 Gina took my Sammy photo, put it on a shirt and "blinged" it out for me. Contact her at blingitonbabe@yahoo.com if you'd like her to make one for you! Shirts are $50-60 depending on the amount of bling used. My friend, Gina, at Bling it on Babe added to the back of the Sammy t-shirt she created for the Mid-Sate Fair show in Paso Robles. I love the Red Rocker "R." Contact Gina at blingitonbabe@yahoo.com if you 'd like her to create an original for you or another true Redhead! Prices are $50-$60 depending upon the detail and amount of crystals used. You won't be disappointed. I took three of my friends to see their first Sammy Hagar & the Wabos show at the Mid-State Fair. Thanks to the local radio station KZOZ I was able to take two of them with me for free. Needless to say, they are now officially REDHEADS and are attending the October show in Fresno with me. It's so exciting to have them REALLY understand what I have been talking about for years! So Captcha is not working and I don't even know how to send a message to admin to fix this. HELP!!! Check out the Awesome t-shirt Gina at Bling It on Babe in downtown Atascadero made for me to wear to the show in Paso Robles! I love the swarovski crystals on it. I have three more chances this year to win the backstage passes to meet Sammy, but I REALLY want the backstage passes for the Paso show! We'll find out soon who the winner is! Since Sammy and the crew are practically going to be in my backyard for The California Mid-State Fair, do you think they would want to come over for a BBQ before the show? Really, Kari and the girls are welcome too! I can make my husband BBQ some Santa Mari style tri-tip with garlic bread, ranch beans, green salad and peach cobbler with fruit from our tree. It really would not be a problem! I was just getting kind of used to being in the front three row and now I will be back further for Costa Mesa and Fresno. It is all good though because my best friend, who I have seen every show with except for one, will be at both of them with me.